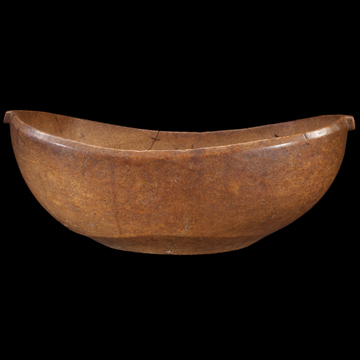 The basic tab-handled form is traditional and one we see variations on throughout the Woodlands cultures. The artful quality of this example is masterful and goes far beyond something carved for mere utilitarian intent—from the skilled execution of its thin, deep walls on the bean-like form, tab handles, chamfered rim to the tapered incurvate lead into the foot. The exterior has taken on a rich dark nutty brown hue with burnt sienna undertones, while the interior has contrasting dry, earthy tonal gradations-the result serves as a benchmark for complex patination and surface integrity.